Let us be open accepting individuals, sensitive to change and willing to take courses untraditional, unknown to us. Let us live as examples of God's love. Get to know our Parish administration team, including our Pastor and Parish Coordinator. Learn about our Parish Pastoral Council, our current council members, and discover other important information like meetings and minutes. 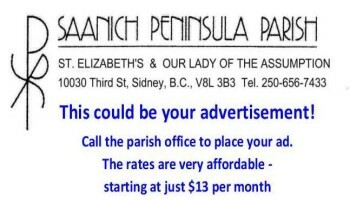 Discover the history of our parish, dating back to 1850, when Fr. Lempfrit, OMI, baptized over 300 Saanich Indians. We are responsible for the resources that the Creator has given us. Learn about our latest "green initiatives" here.